Do you remember this from World Expo 88? When it comes to recognising highlights from Brisbane's modern history, most people would agree that World Expo 88 is one of the most important. This is the event that has been credited with changing the face of Brisbane forever through shaping a new cultural identity for the city. It's hard to believe that it has been 25 years since the magic of expo captivated all who attended. To help commemorate this anniversary, visitors to the newly re-opened museum of Brisbane will be able to reminisce about the days when Brisbane partied hard for six continuous months, with the exhibit Light Fantastic: Expo 88 Parades Rewired. For those of you unfamiliar with the phenomenon that was Expo 88, this world's fair attracted almost as many visitors as there were people living in Australia at that time. International and local pavilions, restaurants, and entertainers keep the festivities going day and night. 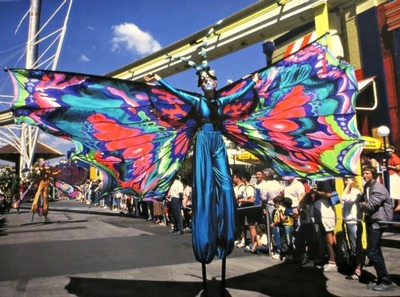 The iconic expo parades became a focal point of expo entertainment. Two parades ran each and every day featuring magnificent costumes, animated performers and spectacular floats. The lunchtime parade included floats of oversized picnic food being carried by a bunch of cheeky yet well-organised ants and an enormous sink of pots and pans with bubbles overflowing. The night time parade was when the streets of expo really began to shine as a whole new set of floats, costumes and performers became beautifully illuminated. Interspersed between the floats would be street performers - some intriguing, others comical, but all were entertaining. The light fantastic exhibit explores many aspects of World Expo 88 but pays particular tribute to the expo parades. The exhibit begins with an overview of World Expo 88; the planning, the experiences and the legacy. 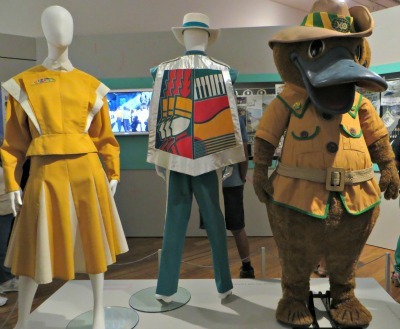 Expo 88's cuddly platypus mascot, Expo Oz, can be found here where he is once again warmly welcoming visitors. The striking displays of what was once considered futuristic (now considered vintage) uniforms belonging to staff and the marching band transport you back to a time when shoulders pads, big hair and over-the-top colourful clothes were all considered to be trendy. The memorabilia and merchandise display is quite impressive for its quantity and variety of items that have been collected. I found myself saying far too many times "oh, I had one just like that". For those of you who missed World Expo 88, this part of the exhibit is really beneficial as it does a great job of demonstrating the rise of this spectacular event from its humble beginnings. It captures the essence of what was possibly the most glorious time to be living in Brisbane when, for six months, it was firmly placed at the forefront of the world's stage. 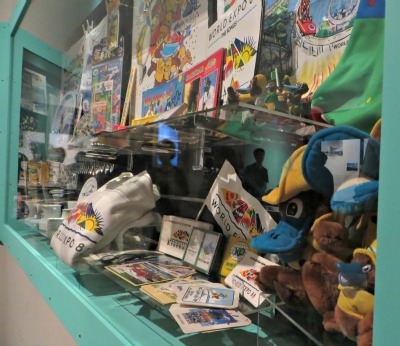 Expo merchandise and memorabilia - which of these do you still have? The meticulous detail in float and costume design is carefully and colourfully displayed through the use of photographic images, audio visual recordings, original draft plans and model replicas. There has even been original material kept by parade producer and exhibit curator, Mike Mullins. 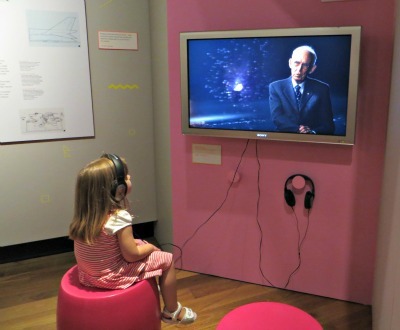 While the imagery is beautiful and captivating, there are also plenty of interactive elements to this exhibit. What's your most memorable moment from World Expo 88? Visitors to the exhibit will have the opportunity to share their favourite expo experiences at the 612 ABC Brisbane memory booth. Tucked away in the wall you will find a comfy bench seat with sound and visual recording devices to preserve your expo memories. It is the last room of the exhibit which is truly awe-inspiring. You can't help but be impressed by the mesmerising images of the night time parade shown in full effect by a darkened room. 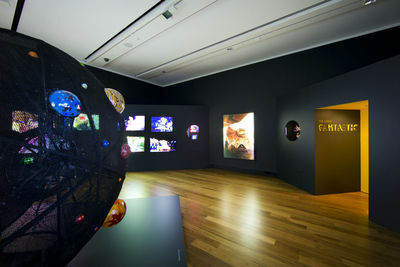 The centre piece of this room is a moving planetary wheel, just as it appeared in the night time QANTAS light fantastic parade. The performer inside this contraption was responsible for pushing it along the parade route while crowds gasped as the colourful orbs spun and weaved. This area of the exhibit is an absolute delight to the senses. 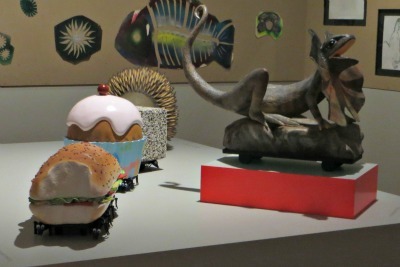 The day of our visit to this exhibition coincided with the re-opening weekend of Brisbane City hall and the museum of Brisbane, which proved to be popular with visitors. Maybe it was the large crowds that helped but throughout this exhibit it almost felt like we were back in 1988. Strangers in the crowd were talking to each other again, comparing expo stories of favourite pavilions, memorable concerts or most-loved works of art. This trip down memory lane clearly stirred emotions in people as seen by the look of pride radiating from their faces. The sense of achievement the people of Brisbane felt at being able to pull off such a momentous event is still apparent today. While the carnival has well and truly been over for almost 25 years, the legacy of World Expo 88 is firmly entrenched in modern Brisbane culture. Together, we certainly did show the world. 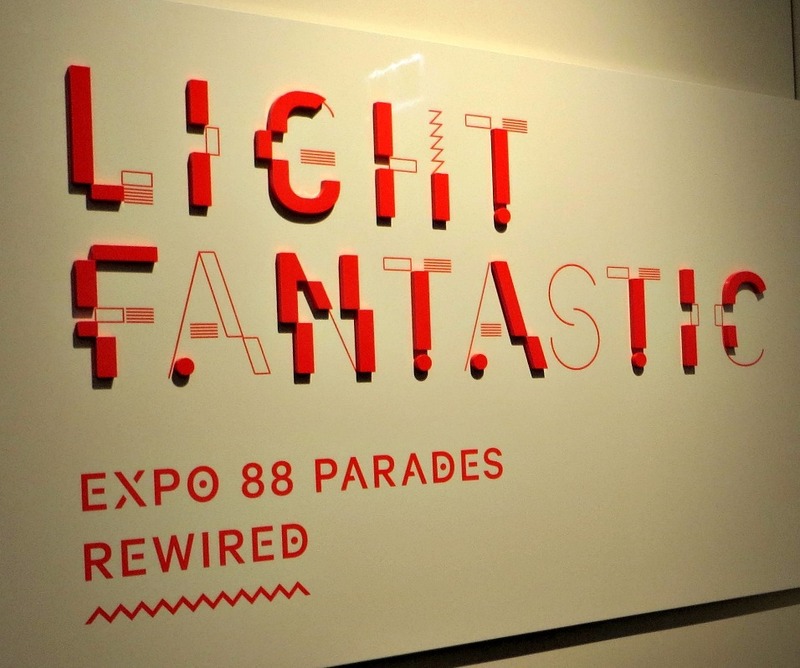 The exhibit Light Fantastic: Expo 88 Parades Rewired is on now at the brand new museum of Brisbane until January 27th, 2014. The museum of Brisbane is located on the third level of Brisbane City hall. It is now easily accessible by lift, so it is wheelchair and stroller friendly. Entry to the museum is free. If this is a taste of the excitement that the museum of Brisbane has in store for visitors, then I can't wait to see what they come up with next. For fans of expo 88, this is a must-see exhibit where you will get the opportunity to relive magical expo memories. It is also a fantastic way to introduce a whole new generation of Brisbane to the greatest party that this city has ever held. What better way to celebrate the 25th anniversary of Brisbane's proudest moment.